Walsall top scorer Tom Bradshaw scored twice against former club Shrewsbury Town to earn an FA Cup first round replay. After Bradshaw found the bottom right corner to cancel out defender Mark Ellis’s early first-half opener, James Collins put Shrewsbury back in front. 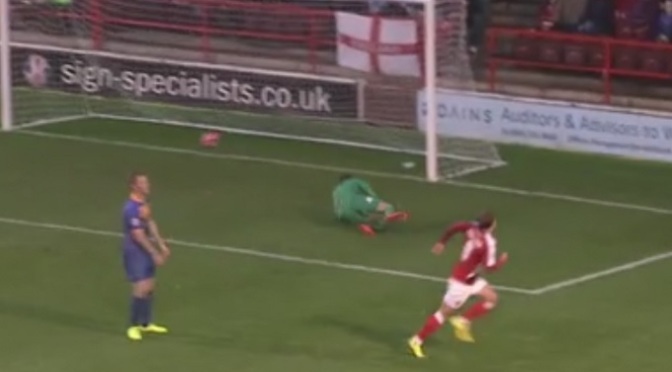 His shot from outside the box looked to have avenged Shrewsbury’s 3-0 Cup first-round exit at Walsall a year ago. But Bradshaw levelled again to rescue Dean Smith’s Saddlers on 90 minutes. He deflected in a shot from Paul Downing for his ninth goal of the season just when the League Two side, who put out three higher-ranked teams on their way to this season’s League Cup fourth round, were scenting another upset. Town led inside five minutes when an inswinging corner from Liam Lawrence was only partially cleared and big defender Ellis slammed a low drive into the net from 10 yards. Bradshaw then equalised in the 56th minute with a low drive from Romaine Sawyers’ pass, only for Shrewsbury to regain the lead five minutes later, when Collins deflected in Andy Mangan’s free-kick. But Bradshaw popped up again to book his return to the Greenhous Meadow on Tuesday week (18 November, 19:45 GMT).